The exceptional guide for your house hunting safari...because hunting alone can be dangerous! Why Choose HouseHuntress? I love the hunt! My favorite expression is: "If you don't know where you are going you will probably get lost and eaten by a lion!" If you haven't chosen a home yet and you aren't quite sure where you're going, it really can seem like a jungle out there: With 10,000 homes, hundreds of agents, loan officers, home inspectors, settlement companies, and thousands of regulations...why not get the best guide available to help you sort through all the details? As your personal HouseHuntress, I will make your house hunting safari easier, safer and faster than a self-managed hunt. I began my career as a technical recruiter and always referred to myself as a headhuntress. The hunting aspect of real estate is what attracted me to switch industries. There are many similarities between matching people with their perfect job and matching people with their perfect home. It all starts with a thorough understanding of your needs. Each match is very individual, and I am building my business on my ability to listen and understand your wants and needs. Patience, tenacity and focused marketing are the hallmarks of HouseHuntress service. When you work with me you will get focused attention, skill, speed, coordination and follow through, so that you don't get ambushed in the process. Remember, I love the hunt, and together we can make the process FUN. My deluxe safari coach even has a DVD player in the back seat for the kids, so that you can focus on the big game out there: the choicest homes in the Chesapeake Bay region! Once I understand your desires, I can help you determine what you can realistically afford, and what financing options are available to make your dream house your very own home. Your motivation to purchase and my expertise create targeted energy that we can use to plan our route through the jungle and find your perfect home. We will be partners every step of the way, because I expect to provide you with service that exceeds your expectations to the point that you will brag unashamedly about the HouseHuntress! 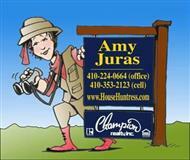 HouseHuntress knows Annapolis Waterfront and Water Privileged Communities! Water privileges and rights are not all equal. I have been a resident of Annapolis for over 20 years. I was president of my waterfront home owners association for over five years. I spearheaded a $1.6 million dollar capital improvement dredging project for my community and learned a lot about water privileges, water rights, and the joys and responsibilities of waterfront property ownership. I am a sailor, and a water-skier and I know the waterfront communities in this area from both sides of the shoreline. Even if waterfront is not your immediate goal, Anne Arundel County has many wonderful water privileged communities! Beaches, parks, marinas and yacht clubs are all part of the community lifestyle. HouseHuntress knows Schools and Children's Activities! Knowing where to go to get the information you need about area schools is an obligation I take very seriously. I am the mother of three young children, ages 25, 21, and 19. Whether you need information on public, private, secular or non-secular schools, I can help! I can also help you get your children involved in their new neighborhood quickly by leading you to the sign-ups for sports , camps, children's theater, Chesapeake Childrens Museum and many other great community resources. Community Connections: I have always believed that community involvement is important. Everyone must nurture themselves and the world around them by sharing their talents and gifts in constructive ways. Creating connections through community involvement in a variety of activities and throughout my career has helped me build strong friendships and alliances. I have been a member of the Annapolis Chorale, and I know the cultural happenings in Annapolis, Baltimore and Washington, DC. I also know many individuals in the medicalcommunity. Remember, we are going to be partners. My connections are your connections! HouseHuntress says: "Let's begin the hunt by utilizing our database of over 10,000 homes in the Chesapeake Bay region."